Portable anti-viruses are light in size and don’t require installation. It is useful when your PC is compromised in a virus attack, and you are not able to install a regular antivirus. In such a case, portable antivirus helps you to clean your computer. The portable antivirus only works when you run the scan manually. It will remove the threats that are already in your system. It doesn’t have real-time protection capabilities. If you want a fully fledged antivirus, then check out list of few reliable antivirus software that offers a strong shield against modern computer threats. When you need a Portable Antivirus? If you are a computer technician who often encounters the computer virus on different PCs, then portable antivirus is for you. You can save lots of time downloading and installing a traditional antivirus on the client’s computer to remove threats. Also, portable antiviruses are low in size so you can carry more than one in your USB drive. Just plug it in your client’s computer, and run the scan without any installation. For a regular computer user, the need for portable antivirus arrives when their computer is deeply infected with viruses. The first step in a virus attack is to disable the protection shield of a system and prevent the installation of security suites. It also has been seen that viruses even block the websites of anti-viruses. In such a situation, the portable antivirus could help you. You can download it on a separate computer and put it in the USB drive. Then run it on the infected PC. It will detect and remove the viruses without installation. Below is the list of top 5 portable antiviruses that could save you from losing your important data in a virus attack. Microsoft Safety Scanner is a free & portable antivirus. It is available for 32 and 64-bit architecture. It is a second opinion antivirus scanner that doesn’t offer real-time protection. You need to run the scan manually. It perfectly runs along with any other security suites without interfering them. This tool not just detects and removes the malware but also tries to reverse the changes due to viruses. 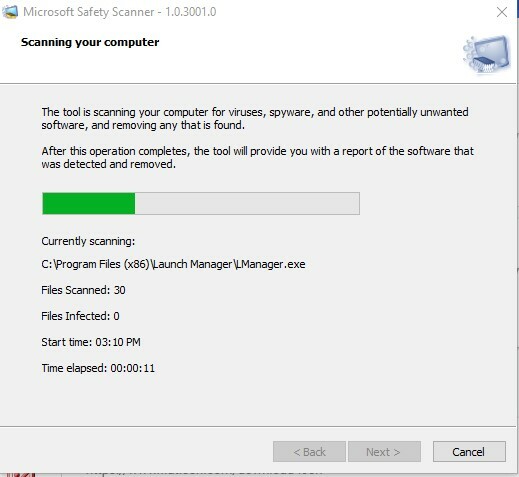 Microsoft Safety Scanner only works for 10 days after downloading it. It requires downloading again if you want to use it further. Microsoft does it so that you always have the latest virus signatures in the program. Being a portable antivirus, it can’t automatically update the database. Multi-Scan Mode – Different scanning mode according to your need Quick Scan, Full Scan, and Customized Scan. Authentic Virus Database – Microsoft professionals itself updates the virus database. Comodo Cleaning Essentials has a collection of security tools that help you to clean an infected computer. Its powerful antivirus detects the deeply embedded viruses by analyzing the processes. It also catches the viruses hidden in the windows registry. That’s why it effectively detects rootkits. It also includes the Comodo KillSwitch which is a comprehensive process explorer tool. It analyzes the running process and kills the wicked ones. Also, Comodo Cleaning Essentials provide detailed statistics and graphs of system status. KillSwitch – Helps to identify, monitor, and terminate potentially unsafe processes. Autorun Analyzer – Lets you know which process or service auto start when the windows boots up. Useful in identifying the spyware and rootkits. Multi-Scan Mode – Has the option to choose between Smart Scan, Full Scan, and Custom Scan. Avira PC Cleaner is a portable virus scanner for Windows PC. You can easily transfer it on your USB drive and run the scan on any computer. The best thing about this antivirus is, it perfectly runs alongside other antivirus programs. When you download it from the website, its size is just about 3.8 MB. However, it downloads the actual program when you run it which size is about 88 MB. Still, it should be considered a lightweight application. Once it completes the downloading, you can also transfer it to the USB drive to scan a computer without an internet connection. Quick and Full Scan Mode. Transfer the scanner to a USB device. 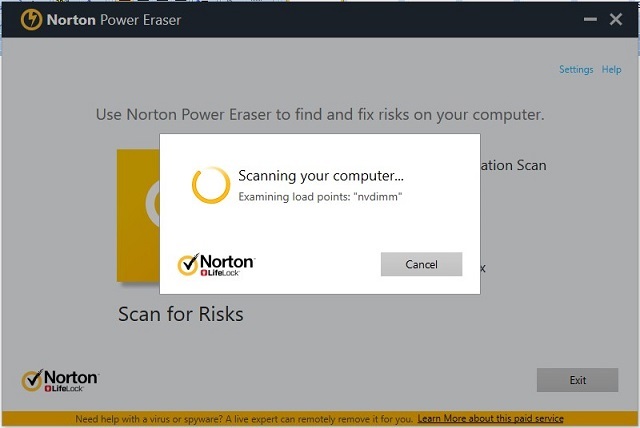 Another portable antivirus is Norton Power Eraser. It is designed to detect and remove deeply embedded malware and viruses that traditional antivirus couldn’t easily remove. This tool is not just lightweight and fast, but it also has the most competitive detection rate. It also targets the threats that look legitimate at the front but steals your data from behind. Norton Power Eraser has different scan modes. You can scan your PC for rootkits, Unwanted Applications, or viruses; the advanced scan has three different scan modes. 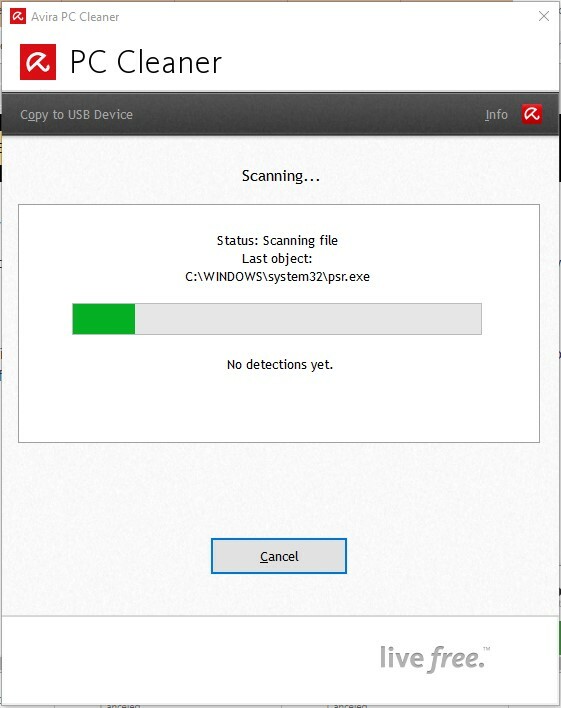 Reputation Scan lets you check a particular folder or file quickly, while, the System Scan checks for viruses in the current operating system. If you have more than one OS, then you can use the Multi-Boot Scan mode. Unwanted Application Scan – Detects and removes PUPs like adware, browser add-ons, and hijackers. Advanced Scan – performs a quick scan, system scan, or multi-boot scan. Advanced Settings – allows you to configure the network proxy settings, the location of log files, and rootkit scan. McAfee GetSusp is designed to catch the undetected malware from a computer. If you suspect that there is malware in your computer, you can use it for a second opinion scan. There's no need to uninstall your current security suite. McAfee GetSusp won’t interfere with any other antivirus. 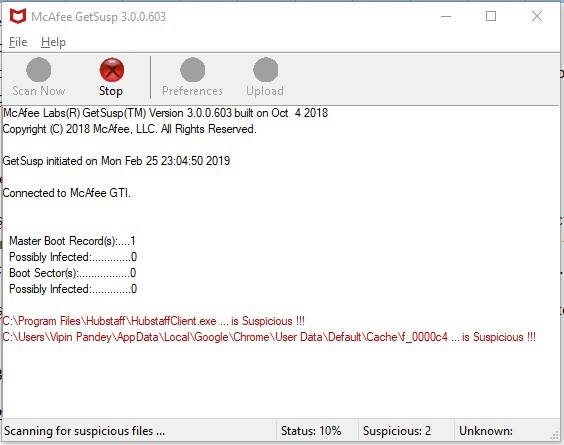 McAfee GetSusp uses a combination of heuristics and signature-based detection mechanism to check the suspicious files. GUI and Command Interface – You can run this tool as a regular computer program as well as from the command line interface. You can also configure the proxy settings for your LAN and can use automatic configuration script from the preferences. These portable antiviruses may seem low in features, but they could be a lifesaver if you have a stubborn virus. Some of these antiviruses even remove the rootkits which are specialized in hiding themselves. So, don’t underestimate them by looking at their size and features. However, portable antiviruses couldn’t replace the need for a regular antivirus. They lack the real-time protection feature. So once you remove the current infection, install a regular antivirus in your system to stay protected.